You’ve got to have a pretty compelling reason to layer on the wool, zip into a drysuit, and slide into Arctic waters chilled to roughly 36 degrees F during mid-winter in Norway. How about floating with orcas on the hunt for shoaling herring? This is serious snorkeling. From December until early February, hundreds of orcas lured by a moveable feast of understandably skittish herring make their way into Andfjord in Northern Norway’s Vesterålen archipelago for an all out feeding frenzy. That you can get into the water to snorkel with the animals as the dinner bell is ringing is one of those things that hardly seems like it should be possible, but readily is. 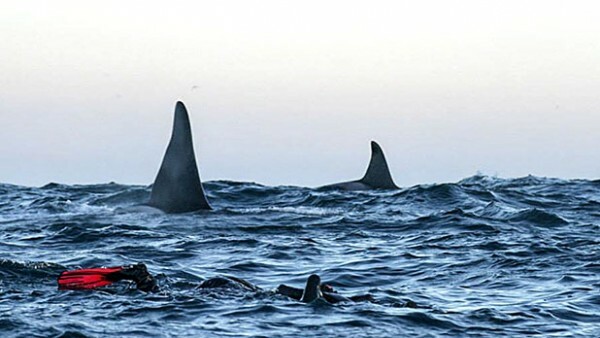 Orcas are regularly seen along the coastlines in places like New Zealand and British Columbia, but only in Norway can you get into the water to snorkel with the ocean’s apex predator. And Andfjord’s proximity to the continental shelf – which comes closer to the town of Andenes here than anywhere else along the Norwegian coast – brings the deep water action and inhabitants surprisingly close to land. “Every day is different,” explains Rolf Malnes, captain and owner of Lofoten Opplevelser, an operator that brings drysuit-clad snorkelers out from the harbor in Andenes aboard RIB boats to snorkel with the whales (about $250 per person), which are often spotted just minutes after leaving port. The orcas’ movement along the coast of Norway has everything to do with the herring, explains Malnes. 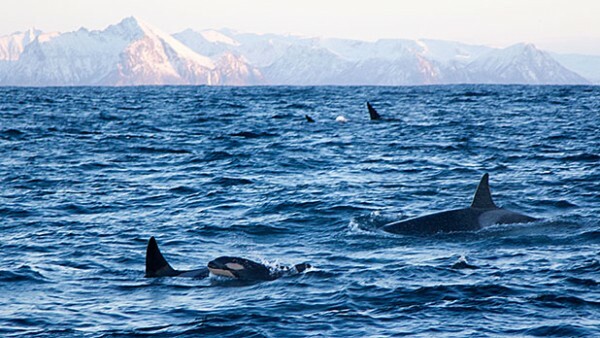 Before the herring were coming into Andfjord to spend its overwintering months, says Malnes, it was Tysfjord, a few hours to the south, that saw the lion’s share of the herring and thus the orcas and orca snorkeling tourism. But all that stopped around 2012, when the herring switched their hiding place. “The herring keep changing their patterns because they hope to fool the predators,” Malnes explains, “It’s in the genes of the fish to go deep into the fjord to hide in the winter time because the waters are more protected.” It’s also in the genes of orcas to hunt herring. Orcas aren’t the only mammals in the water. The waters are brimming with whales that use the deep waters along the continental shelf as a sort of migratory highway. Humpbacks, minkes, and fin whales (the second largest whale in the world after the blue whale) all converge off Andenes when the herring are shoaling and can be spotted by snorkelers. During the summer months, sperm whales are regularly seen in these waters, too. Sven Gust of Northern Explorers — another operator that takes snorkelers out to see the whales, this time aboard a former whaling ship – agrees that this “Arctic sardine run” offers a singular snorkeling experience. “The whales are looking for the easiest way to eat,” says Gust, adding that orcas have been seen following humpbacks into the depths hoping to capitalize on the leftovers after the baleen-feeders take more than a mouthful. And humpbacks have also been seen here cutting through a bait ball formed by the orcas (which need to gather the herring together and then strike them with their tails to daze and eat the fish one by one) for a ready-prepared meal. And while it’s tempting to try to approach the whales or even swim through the shimmering bait ball (yes, more than one snorkeler and free diver has dared), your best bet is just to lay in wait. “If they don’t want contact with us we see it quite soon and we just have to wait,” says Malnes. But when it’s time to enter the water, the best thing to do is to lie still on the surface, avoid splashing and wait for the whales to pass by, he says.